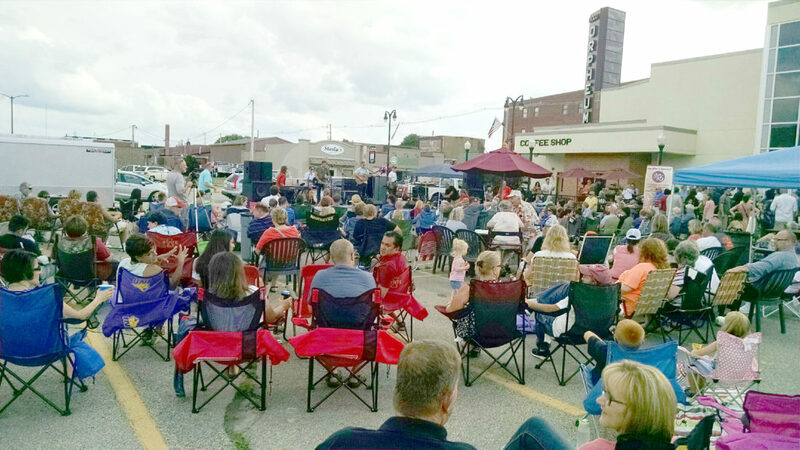 T-R PHOTO BY JEFF HUTTON A large crowd gathered for the “Live After Five” concert this past Friday. Ask anyone who attended last Friday’s “Live After Five” event and they’ll tell you that this is exactly what Marshalltown needs to do more of. Great music, food, drink and an abundance of community spirit made this gathering in the parking lot adjacent to The Orpheum theater one to remember. Give credit to Orpheum Director Bob Untiedt, numerous volunteers, corporate sponsor Lennox and the hundreds of attendees who came together to enjoy a wonderful evening out as we listened to The Nadas perform. But most remarkable is that after last year’s inaugural start, Live After Five, has now established a solid foothold in the community. There is a real desire on the part of Marshalltownians seeking free, family-friendly entertainment and a place to gather where we can take a break from the work week, sit back and relax. And the reason for the success is that residents and sponsors understand we need to support local initiatives like this. Bob has a long line-up of acts schedule for the next eight Fridays — diverse, eclectic musicians ready to perform for a relaxing 90 minutes each. All we have to do is bring our lawn chairs and just soak in the festivities. Live After Five, of course, is not the only game in town. Marshalltown organizations, be in The Orpheum, The Central Iowa Art Association, the American Legion Post 46, the Marshalltown Regional Partnership, the Marshalltown Convention & Visitors Bureau, the Marshall County Arts and Cultural Alliance, the Marshalltown Community Theatre, Marshalltown Community College, and so many more, work tirelessly on bringing Marshalltown residents together through different events, entertainment opportunities, etc. We have to make a concerted effort, however, to support these organizations and their good works. Yes, it’s OK to travel to Des Moines or elsewhere on occasion for a night out, but let’s keep in mind what we have right here in our own backyard. Last Friday’s event should remind us that there our great opportunities in Marshalltown — we just need to grab hold, come together as a community, and enjoy the ride.